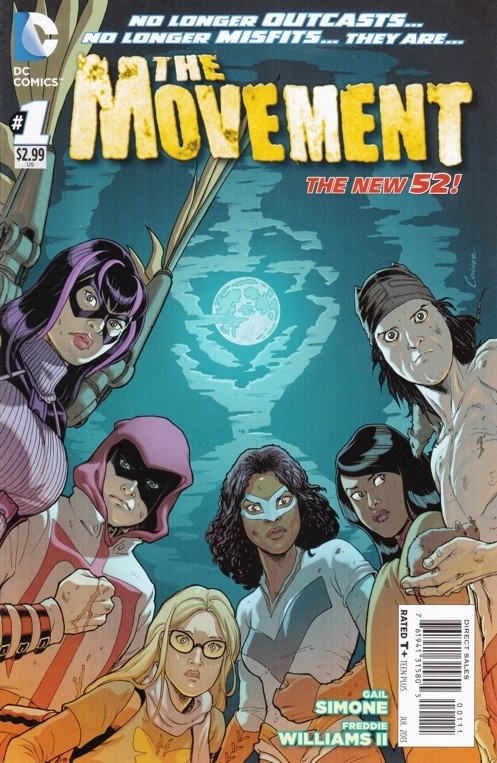 For a New 52 title by DC Comics, I can say The Movement definitely fits the description of “new.” New characters. New concepts. But not enough to reel me in. Taking over a section of the city called the Tweens, the Movement is a group of outcast citizens, all with super human powers. The Movement is basically an army of citizens that takes a stand against those who abuse their power of authority; police officers and government officials, by exposing their corruption to the public. They will stop at nothing to keep their territory crime and corrupt free. The Movement reminds me of the Occupy movement, the protest against social and economic inequality. The only difference is that The Movement are super powered heroes. So this series is more like a modern-day super hero type of story. They are fighting real villains; corrupt authoritative figures. I was not hooked at all by this story. No page turners. One character in particular I don’t care for is Mouse, the prince of rats. When he summons them, they follow him by the masses. Yuck. Gross. I don’t see this title going very far. I will not be reading the next issue. Gail Simone is the writer. Good character interactions. The story may work for some readers, but I prefer not to see super powered heroes in this type of story. I want to see them fighting super villains, monsters and aliens. Freddie Williams II is the artist and Chris Sotomayor is the colorist. Great visual storytellers. I have no complaints in this area. I sure hope this series is NOT the replacement for Demon Knights, one of my favorite New 52 series that is on the chopping block.